Infinix has launched its Note 5 Stylus smartphone in India. As the name suggests, the handset comes with support for the company’s XPen stylus that looks similar to the Samsung Galaxy Note9’s S-Pen. The stylus has provision to create smart screenshots, write notes, create memos, and draw a painting on the phone’s screen. The other highlights of the Infinix Note 5 Stylus include a vanilla Android OS, a beefy battery with fast charge support, and full-screen 18:9 aspect ratio display. The Infinix Note 5 Stylus comes clad in a full metal unibody design with a 5.93-inch display that bears full-HD+ resolution (1,080 x 2,160 pixels) and 407ppi pixel density. The handset is powered by MediaTek’s 2GHz Helio P23 chipset aided by ARM Mali G71 GPU and 4GB of RAM. The storage onboard is 64GB, which could be further boosted by adding a microSD card. In the camera department, the Note 5 Stylus sports a 16MP sensor both on the front and back. However, the rear camera comes with a f/1.8 aperture lens, dual LED flash, HDR, AI Auto scene detection, Portrait mode, and Panorama mode. On the other hand, the front camera boasts of f/2.0 aperture lens, soft light flash, and modes such as bokeh, AI beauty, WideSelfie, and time-lapse. On the software front, the handset boots Android 8.1 Oreo along with Google Lens and Google Assistant. Since it’s an Android One device, the Note 5 Stylus will get an upgrade to Android 9 Pie and other security patches. Running the show is a 4,000mAh battery with 18W fast charging and AI power management. 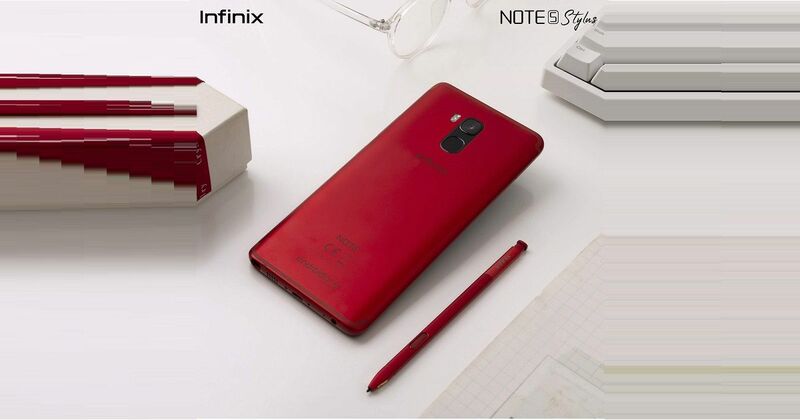 In terms of connectivity, the Infinix Note 5 Stylus offers dual-SIM dual-VoLTE support, Wi-Fi, Bluetooth, 3.5mm headphone jack, support for USB OTG, and a microUSB port. A rear-mounted fingerprint sensor rounds off the specs sheet of the phone. The Infinix Note 5 Stylus price in India is Rs 15,999 for the 4GB RAM + 64GB storage variant. It comes in just Red colour option exclusively on the e-commerce site, Flipkart. As for the launch offers, the Infinix Note 5 Stylus comes with Jio cashback of Rs 2,200 and 50GB additional date benefit.